Sherrie Scraps with passion: You're Frightfully Sweet! I inked around the edges a bit and then assembled this cutie. The leaves are the Lovey Tendril die from Poppystamps cut out 3 times. I added a sweet PK face using PKK14~4" Winter Face stamp set. I tied on a pretty bow with ribbon from DL.ART called~Green Leaf and then added a fun tag. The tag is Jaded Blossom's~ Card Mat die and the sentiment is Scrappy Moms Stamps~Warts Up stamp set. The skittles are from Carri over at DoubleClick. I inked the edges on this as well and then added these sweet little ghosts. The ghosts are Jaded Blossom's Halloween Dies which I inked up and added sweet little faces to them. The faces are PK1429~Variety Face Asst. The tag is Jaded Blossom's Card Mat Dies and the sentiment again is from Scrappy Moms Stamp~Warts Up! The yummy Hershey Kisses are decorated with sentiments from Jaded Blossoms Cupid Repellent Candies and Monster Candies stamp sets. These treat boxes are so super cute!! Love them both!!! Have a great day. 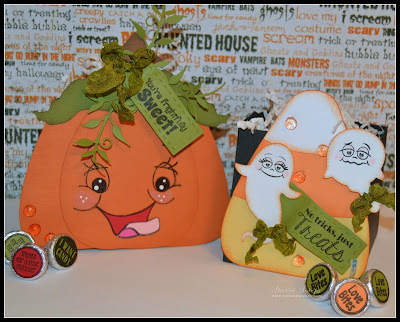 These are adorable and spookily cute ! Love them Sherrie ! Fabulous project Sherrie, love those sweet faces! Great way to use that 4" stamp, I have those in my stash and have yet to use them! 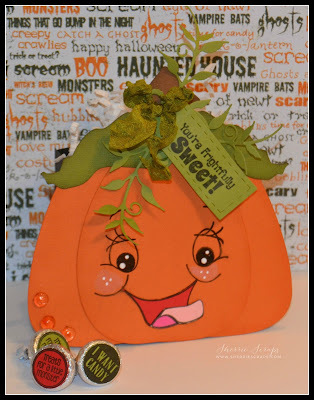 Thanks so much for joining in our challenge over at Scrappy Moms Stamps! So super cute Sherrie! I love the faces you put on them!! Sherrie these treat boxes are adorable!!!! LOVE the cute pumpkin! The face is so darn cute! 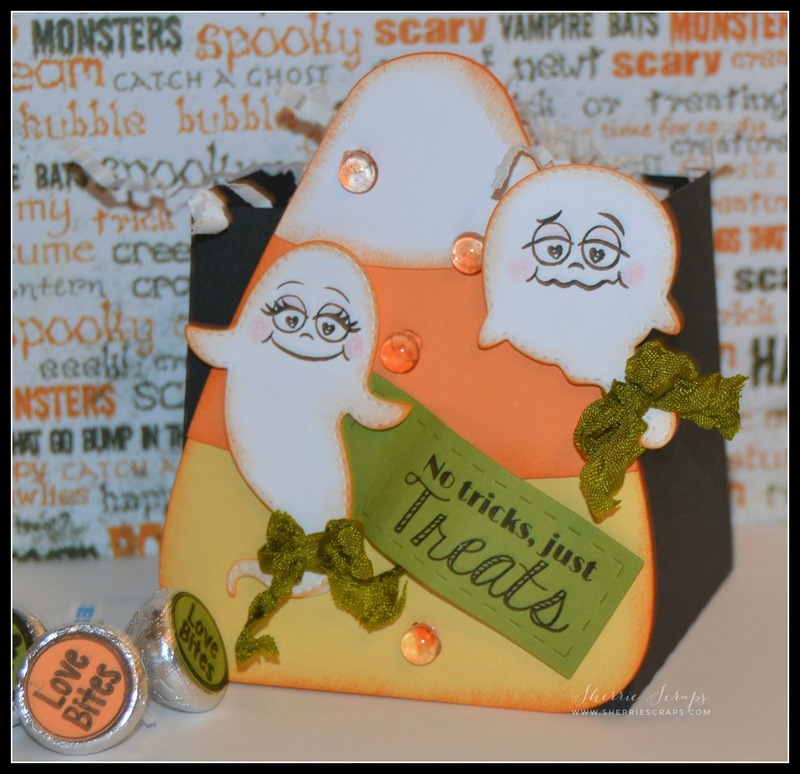 And the ghosts are so cute on the candy corn treat box! Really cute my friend! Love the hershey kiss candy accents too! You always know how to dress up treats so lovely! You are the queen of that!!! Sooooooooo cute! LOVING that CANDY CORN!!!!!!!!!!!!!!!! Both are great, but I especially love the pumpkin!! Love the super cute pumpkin and adorable candy corn!! ADORE the PK faces..TOO cute my friend!! Cute cards, gr8t job on the faces! Oh my goodness these are adorable Sherrie and the cute faces, love them!!! Thank you for joining us over at Decorate to Celebrate. Amazing cute...You are the master of embellishing! Aw, so sweet and cute! Thanks for joining us in the Scrapy Land Challenge! Hope to see your pretty projects again. Wow! These treat boxes are just 2 cute! Oh Sherrie these are as always super duper cute. Love the faces. So very cute Sherrie! Your grandchildren must love to visit Grandma's house! 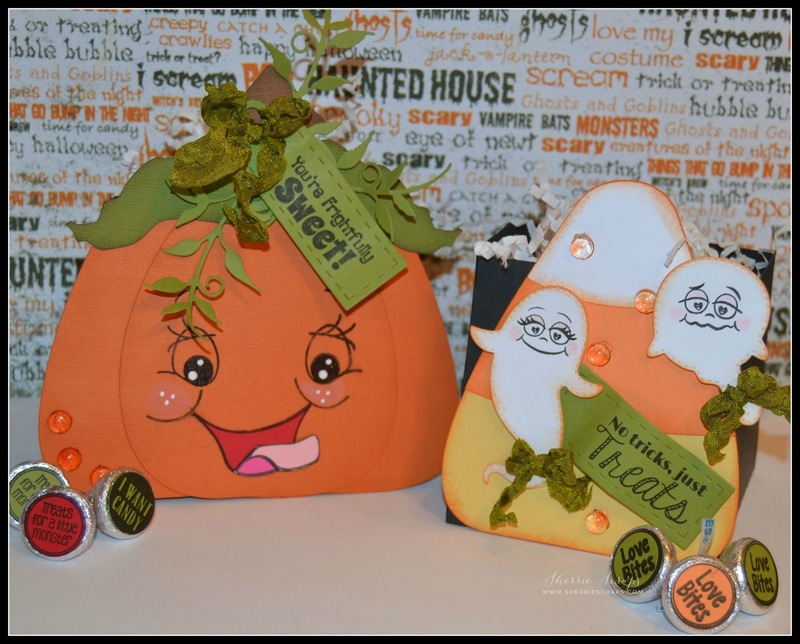 :) These projects give Halloween a whole no meaning :) So fun and cheerful! Oh look at those adorable boxes! The faces are just so CUTE and I just love the designs! Total CUTENESS!!! LOVING the faces you have chosen....adorable!!! Oh my, these are just so darn cute!! I love the eyes, they are just perfect and such cute faces! The addition of the bows and tags are perfect too! Thanks for playing along with us at Scrapy Land Challenge #27! Sherrie ~ Well aren't these over the top ADORABLE!!! From the faces, to the doodling, the ribbon and papers ~ so stinking CUUUTE!